Homeless after years of feeling trapped in a world that doesn’t understand. Growing up in a middle class neighborhood with dreams, talents, and goals just like many of us. It happens to thousands in Cincinnati every year regardless of age, income or race. 150 of these individuals are saved by generous donors, including the Cincinnati International Wine Festival. One of these individuals is Rick, who has been saved by Tender Mercies. Rick, 47 years old struggled for most of his life without the support he needed from his parents who turned to alcohol due to their own bouts of depression. As a child in a dysfunctional family, learning disabilities were blamed for his inability to progress in school, interact socially and express emotions in an appropriate way. Depending on family, Rick never felt he knew who he was and was always at a loss for how to manage issues. His days were full of sadness and desperation, missing out on life’s moments. Anxiety made supporting himself extremely difficult. Rick was unable to function in professional environments with multiple responsibilities, which resulted in low wage jobs. But he had one passion— sculptures. After years of straining to make ends meet with a low self-esteem and declining mental health, in his 30’s Rick took a courageous step by getting an art degree from NKU. With a natural talent for creating sculptures, he proudly shows his artwork at galleries across the U.S.
After bouncing from family to friends’ houses, Rick found himself homeless with nowhere to go. He lived in his car and a parking lots of businesses in Hyde Park and Hebron. He took random jobs to survive. For a year, Rick was homeless with severe depression, without self-confidence and hope. He also struggled with sleep apnea, but didn’t have the resources for treatment. All that mattered was eating and not freezing in a parking lot. He found a shelter in winter 2014 when it became unbearable trying to work without a place to get a good night’s sleep or shower. While thankful to have meals and a place to sleep, Rick needed a more stable, secure place to recover, rebuild and thrive. A place called home. 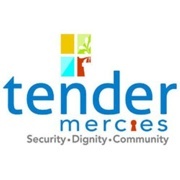 Rick found that place, Tender Mercies, a home for men and women with stories just like his. Stories of heartache, courage, and inspiration. Over the past year, Rick has made a better life. He is managing his anxiety and depression. Because of Tender Mercies support, Rick has had a job for 6 months at P&G as a security guard. Without a private space and a sense of security and compassionate, supportive environment this wouldn’t have been possible. Rick is proud and happy to have a steady job that allows him to focus on his artwork, a significant factor in his recovery. He is doing so well that he plans to pursue a Master’s degree next year.